With all the focus on Samsung announcing a projector-toting mobile phone, it was a surprise today when TechRadar stumbled across a mysterious pico projector hidden among Samsung's glut of new gadgets at this company's CES stand. Fitting in your hand and light as a feather, the yet-unnamed projector boasts LED technology and looks to be the perfect thing to fling into your pocket and to whip out when an impromptu meeting takes place. 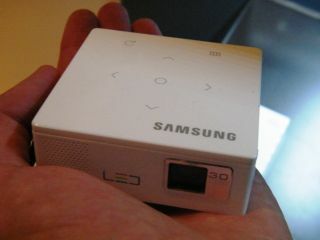 Samsung has decided to take a leaf out of Apple's book and style the mini projector's chassis a nice white. Connections on the thing included VGA and it seems to have an in-built speaker. As for brightness, Samsung has opted for 30 lumens, which isn't bad considering pico projector companies like 3M Pro are releasing devises with brightness around the 15 lumens mark. When it comes to controls, they are touch-sensitive and situated on the top of the device. We have asked Samsung to shed some light on when the projector will be released in the UK, and have asked for more details regarding its name and exactly how big the images will be when projected. It's an exciting time for the pico projector market at the moment, so expect a bevy of these diminutive devices to be released throughout the year.